“I backed the walk because I believe in conviction. I believe that when you set a goal, you should be able to see it happen. I love the idea of embracing the world and in doing so making it smaller. I wish that everybody could walk a day with Matt and by following him on Kickstarter, we can! My class is so excited about this trip and the world is opening to them as well. “Additionally, my personal children have experienced Iraq through Tim’s eyes and were amazed at the similarities between kids in Iraq and here and I hope that Matt’s trip will continue to show them that people are people everywhere. The project has been successfully funded on Kickstarter, but there’s no reason to stop now. Additional funding means books, postcards, or even broken champagne bottles for you, and perhaps a hot meal for me. 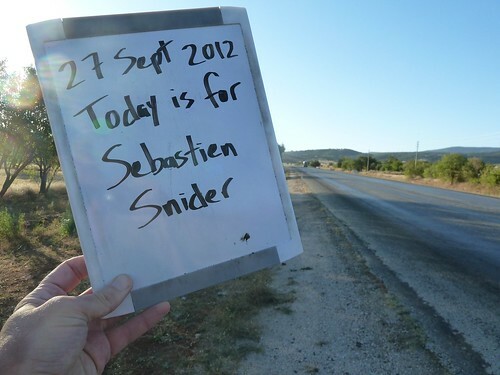 So if you’ve enjoyed following the walk across Turkey so far, and want to get more out of it, check out the Kickstarter campaign. It closes Saturday afternoon USA time, and it won’t reopen. Kids here in Turkey play soccer the same way kids in the United States play baseball. They play it at recess. They play it in PE. They play it in the street before their moms call them in for dinner. Going to a game here where grownups are playing soccer is a really exciting experience. The fans’ energy level is incredible — it’s like lightning is about to come straight out of their heads. I’ve never been to a sporting event in the United States that comes even close to this level of excitement. If you ever have the chance to go to a soccer game in Turkey, I highly recommend it! Camping for the night at an OPET gas station north of Isparta. From my campsite I think I see the mountain that serves as a landmark for my rest week at Lake Egirdir, but that’s going to need to wait a bit — I have three days of walking to get there. 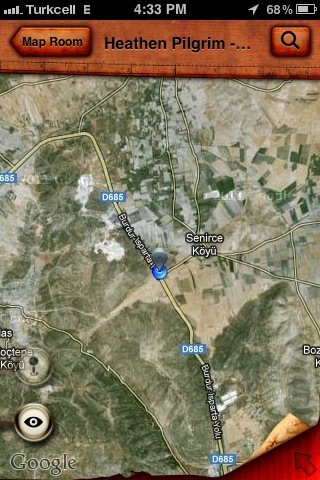 I’m nearing Isparta. Won’t be there until tomorrow, but by car I’m only a few minutes away. My goal for today is a cement factory. I wonder if this is one of their mines. The students in Denise Waters’ 4th grade class at Norman Rockwell Elementary in Redmond, Washington, have started to send me their questions, so you’ll see my answers starting to appear on this blog. Actually, Alisa, it’s a little more complicated than that. This is a lengthy project — I’ll be on the road for 8 months. That’s over half a year! 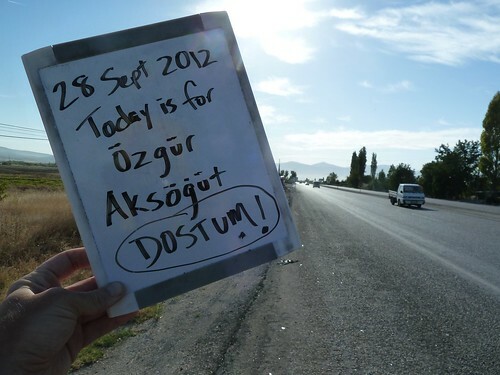 Every day for 8 months, walking across Turkey will be my job. Every single hour, of every single day, of every single week, of every single month, for 8 months. It’s hard to find another adult able to dedicate that amount of time to one project. There are lots of adults who would like to do something like this, but they have other obligations they need to meet — they need to feed their children, they need to pay their mortgages, they need to go to their jobs, etc. Maybe, if they’re lucky, they get two weeks a year to do something like this. But 8 months? No. So the number of adults able to do something like this is very small. You know that saying, “Like finding a needle in a haystack”? Finding another adult to do this with me is like finding a needle in a haystack. Actually though, I am not doing the entire walk alone. On the very first day a friend joined me for the first day’s walk, and at other times during the walk, other friends will be joining me for short legs of the journey. It’s just that it’s very hard to find another adult able to dedicate an entire 8 months to something like this, so I am doing it alone. The other day one of this blog’s regular readers asked me to address some geek questions about what equipment I use on the road. 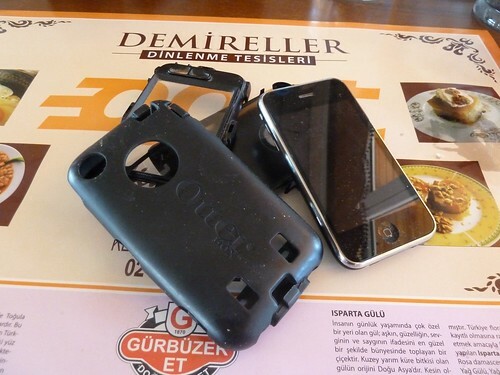 The iPhone 3GS, with a Turkcell SIM card, is my workhorse. There’s a laptop in my pack, but it only comes out once a week. My "go to" apps on the iPhone are Cartographer, which I use to update my trip progress on the Google Map embedded on the Progress Report page of this website, Flickr, which I use to upload photos to the website, WordPress, which I use to write posts, and Gmail. I use a few other pieces of equipment, all quite simple. I’ll address those in other posts over the next few days. I eat some junk on the road, sure. But I make sure I eat at least 1.5 good meals a day. Wednesday I had two, yesterday I had one. So today I’ll make sure I get two. Here’s the first of today’s two. I took this the other day near the village of Kaplanli. The terrain is changing again, already. Hillier, more trees. 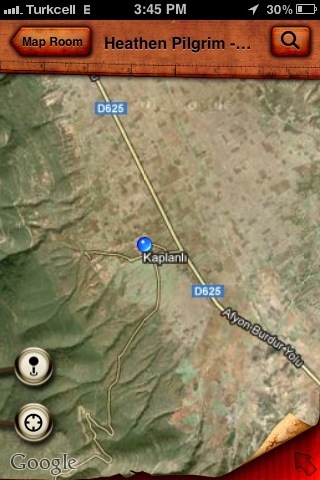 Last night I ended up staying in that village I mentioned I was in, Kaplanli. I camped out in the mosque garden. 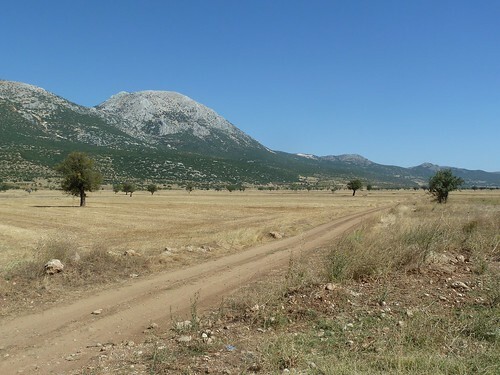 Kaplanli is a village of about 250 people. It’s not even big enough to support a bakkal (corner market), so there isn’t a place within 5 miles to buy bread or water. The stretch between Dinar and where I am now, just outside Keciborlu, is pretty sparsely populated. A car could easily cover the distance in 20 minutes, but walking is a whole different ballgame. 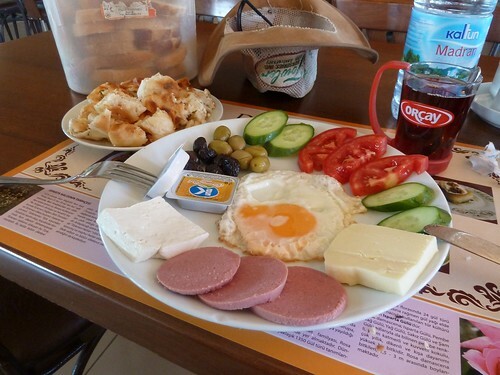 I was humbled when one of the villagers in Kaplanli brought me a huge platter of food, much like the one they brought to me in Horsunlu my first night there, even though I had already had plenty to eat before leaving Dinar. 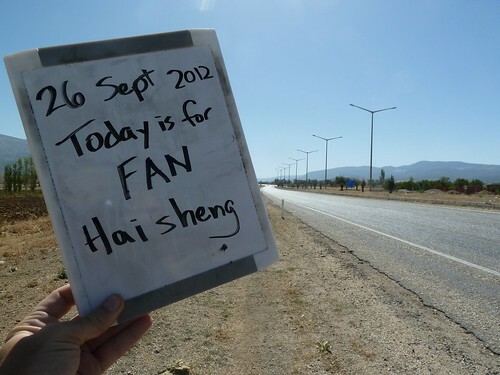 I knew I’d be passing through a sparsely-populated area, so I went equipped with plenty of water and a full stomach. But man, that was quite some platter of food! And I slept really well too — the village was silent, the stars were amazing because there was no light for miles, and it was nice and cool with a gentle breeze, so my sleeping bag was nice and snuggly. I didn’t take any pictures, because I still feel like it’s already rude and intrusive enough to show up like that unannounced. Maybe that’s something internal I need to get over, maybe not. Anyone have any thoughts on that? Thank you so much for your support. About 36 hours ago the Kickstarter campaign cleared the 100% mark, which means the project will get funded. You have no idea how much it means to me to be out here walking across Turkey, nearing the 20% complete mark, experiencing some of the highest highs and the lowest lows of my life so far, all the while knowing that some of the best people in the world are behind me. Each morning when I wake up I think of you and know that I have a job to do, not just because I want to do it, but because others want me to do it too. When the funding window closes a couple days from now, I’ll be able to send out emails to all the backers to collect the information I’ll need to fulfill your rewards. For example, if your reward includes a picture postcard (and most of them do), where do you want me to take your postcard’s photo, and where do you want me to mail it? Stuff like that. I’m on the road now, and will be on the road when the funding window closes. 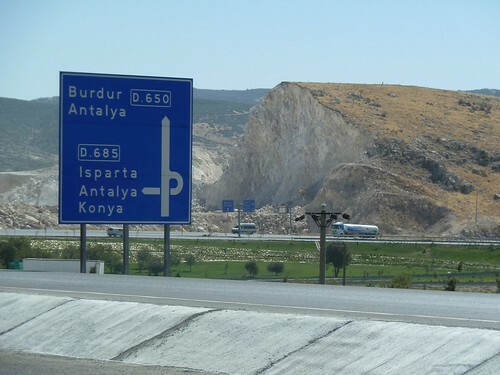 In fact, when the funding window closes I hope to be sleeping peacefully somewhere in or around the city of Isparta. I won’t have much downtime until I arrive at Lake Egirdir, a few days’ walk from Isparta, where I’m planning to take a week off. So you’ll probably hear from me about those reward-fulfillment details sometime during the week after the funding window closes. One more thing I wanted to mention: I am amazed and humbled to see that some of the biggest backers of this Kickstarter campaign are people I haven’t seen much in over 10 years. Some of them I haven’t seen much in 20 years. To know that people I haven’t seen in over 10 years are still out there remembering me well, remembering me as someone worth backing, well, that humbles me big time and just about brings tears to my eyes. I must be doing something right in life. 3. I remember Matt at age 18 & see the same courage in him now. 2. I will never see Turkey & I love the way Matt tells me about it. 1. Matt inspires me with his courage, trust and love for the world – thank you Matt! Do you have friends in Isparta? 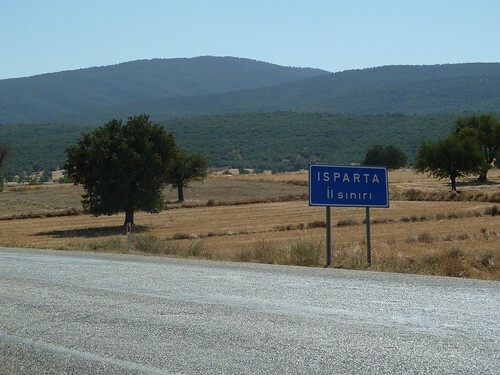 Tomorrow (Friday) evening or Saturday morning I’ll be walking into Isparta. I would love to meet with some people for cay or kahve. If you have friends there and they would like to also, please call me or text at 537 493 2356. In a small village called Kaplanli. Resting in the mosque garden. Going to see if I can crash here tonight. Haisheng was an English student of mine back in Xian, China, in 1992 when I was 22 and he was about 18. Today he put me over 100% on Kickstarter. Thanks big time, Haisheng! “One, he’s doing something I’d love to do, so it’s my encouragement to him so I can live vicariously. “Two, he’s prepared to do this and be successful with it through months of walking and years of living in Turkey. Holy cow, an article on Outside’s website! Outside is like, the big daddy of adventure sports magazines in the US.